I finished writing the first draft of my Lonely Planet text last night, so it was a good time to watch the Top Gear: Vietnam Special, which turned out to be an excellent episode of travel TV and made me want to hop on the back of a motorcycle in Vietnam again. But let me tell you: never mind the show's premise that they weren't travelling fast enough to meet the 8-day deadline to reach the finishing line at Halong Bay. The real reason they took a train from Hue to Hanoi is because there is nothing very interesting between Hue and Hanoi. I should know, I'm writing an entire chapter on that region. I'm not a huge fan of Top Gear like, say, G-man, but this was a good episode. Also a great PR exercise for Vietnam. I fully imagine that legions of fans are going to show up in Halong Bay looking for Ba Hang Bar and in Hoi An to make zoot suits. Congrats on the draft!!! YOU GO!!! Did you like the Top Gear special? I haven't seen it, but Jay was watching it and laughing sooooo hard. I love those guys. I've switched from writing to editing now, which is a dreary task ... I'm way over the word count! I wanna go look for the Ba Hang Bar in Halong Bay! I wanna go make a zoot suit in Hoi An! Editing - good luck with that. It is HARD. Word count is a pain in the behind!!! Do you have an "outside" editor, so to speak? Yeah, I do --- but she was too busy to help me with this batch. I'm flying by the seat of my pants! Hi Tym I'm going to Vietnam to do the Top Gear bike thing in November, any chance you could drop me an email? i have a few questions and would like some advice. Any info please let me know guys! 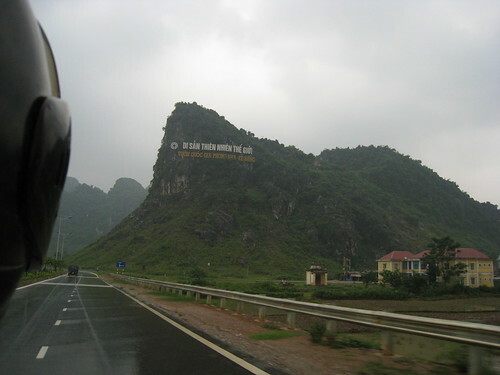 I'm doing the same trip as Top Gear from South to North Vietnam in March 2010 and I'd like some help on how to get to Ba Hang Bar if anyone can help. I am headed to Ha Long in a few days. Did anyone make it that might have some advice? If so, please pop me an email and I will give you a big thank you!!!! Javier... if you email me in a couple weeks, I can tell you about our trip there! Very beautiful and unique scenery. A completely different side of Vietnam from the bustling cities of Saigon or Hanoi where most tourists go. Very serene, peaceful, and remote. We were able to go on a couple kayaking excursions, explore a cave, and take a quick dip while resting on shore one of the karst islands. Quite a long drive from Hanoi so not the easiest place to get to, but the drive from Hanoi was almost as exciting and interesting as the end location as well as the drive is through the northern region's farmland, which is quite pretty.